The Elsevier Fingerprint Engine is a back-end software system of state-of-the-art Natural Language Processing (NLP) techniques to extract information from unstructured text. Applying domain-relevant thesauri to scientific publications of various types, the fingerprint engine creates an index of weighted terms, called concepts, which defines the text, known as a Fingerprint™ . Through the identification and extraction of new concepts the Elsevier Fingerprint Engine can enrich thesauri and generate new vocabularies. 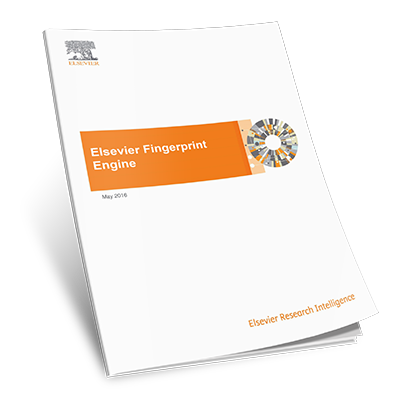 By aggregating and comparing Fingerprints, the Elsevier Fingerprint Engine enables institutions to look beyond metadata and expose valuable connections among people, publications, funding opportunities and ideas.The Elsevier Fingerprint Engine can be used as a back-office processing component of applications, as it is for a number of Elsevier products, or as a stand-alone service.